The 2016 Acura MDX Review: Acura’s MDX midsize crossover is the most successful three-row SUV of all time, and it looks like that’s not about to change. Styling for 2016 is a more expressive rendering of the Acura brand’s busy design. Outside, the pointed nose remains, but all traces of the edgy beak of years past are now gone. Inside, materials are tasteful and nicely assembled, but Acura’s designers seem to think that more is better, and perhaps they overindulged in too many lines going in too many directions. That being said, the overall ambiance is invigorating and feels like it’ll never break or wear out. Acura has banished the transmission lever from the center console, since the mechanism is all electronic shift-by-wire anyway. To avoid any confusion and attendant lawsuits, the drive and park buttons are straightforward pushes, while Reverse is a pull back. Under that lives a new nine-speed automatic, which despite its extra cogs, weighs 66 pounds less than the old six-speed. In the name of fuel efficiency, 6th through 9th gears are all overdrive! The high-tech transmission connects to a hearty 290-horsepower direct-injection V6 with 267 lb.-ft. of torque, great for moving the 4,268-lb. vehicle down the road. EPA numbers give the popular Acura 19 City, 26 Highway, and 22 Combined. I averaged 21.5 mpg—pretty much on the money. EPA Green scores are both 5’s out of 10. My Lunar Silver Metallic test car was great for cruising up to see the grandkids. It’s mellow and smooth on the highway. You can use paddle shifters on the steering wheel to select your own gears, but why bother? My older granddaughter, Naomi (age 7) was thrilled to operate the middle seats and jump into the third row. It seemed roomy for someone her size, but it might feel confining for adults. 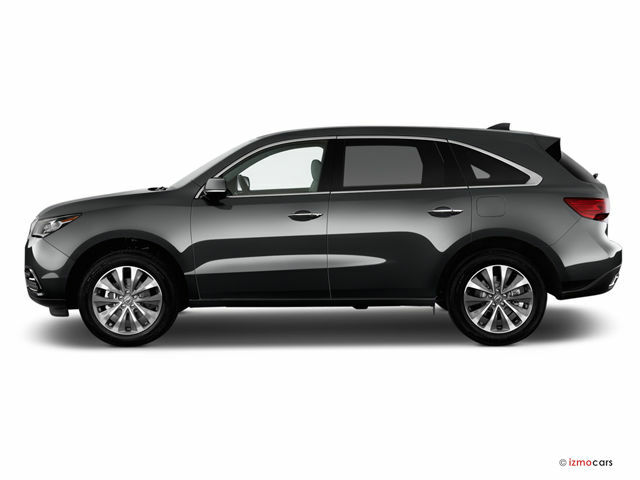 There is just one Acura MDX model, but it comes with various worthwhile packages. All models have an upgraded version of Acura’s SH-AWD, the Super Handling All-Wheel Drive system. It distributes torque not only front to rear, but side to side, too. You can monitor this on one of the numerous selectable instrument panel displays. If you are expecting bad weather, all-wheel drive is a great way to protect you and your loved ones. My tester came loaded with a vast assortment of electronic goodies to keep the car on the road, in the correct lane, and warn you of impending collisions. There are too many electronic marvels to do more than list them. Known collectively as AcuraWatch, they include Collision Mitigation Braking System, Forward Collision Warning, Lane Keeping Assist System, Road Departure Mitigation, Blind Spot Information, Multi-View Rear Camera, and Rear Cross Traffic Monitor. Whew. Think of the MDX as a computer on wheels, where cameras and radar talk to sensors and actuators that can tell the brakes and engine to slow down or pull you back into a lane. You can tell when cars are approaching from the side as you’re backing out of your partially obscured driveway. The Road Departure Mitigation system actually reads the lines on the road and controls the steering, and sometimes the brakes, to keep you aligned. It issues audible and tactile warnings, too, so you really have no excuse for ever having an accident! The Tech Package brings with it much of the previously described high tech safety goodies, along with a killer 12-speaker premium audio system and navigation. You get niceties like rain-sensing wipers and three-zone automatic climate control, too. The Advance Package adds Collision Mitigating Braking, which will slow down the car instantly if it detects that you’re moving too quickly towards the car ahead. It uses the car’s Adaptive Cruise Control, which senses the car ahead and keeps you a safe and consistent distance behind. The Bottom Line: The 2016 Acura MDX has so many benefits coming from the three options packages that it seems like the least equipped MDX would be pretty plain, but a lot of options are included in the base model. Pricing for the MDX starts at $43,785. My test car, loaded with everything, including the delivery charge of $940, came to a total MSRP price of $57,340. Built in Lincoln, Alabama, with an American engine and transmission, the MDX is designed for the U.S. market and boasts a 65% local content. It’s the luxury station wagon of today, and sales numbers show that it’s what many folks making a good living want to drive. And maybe, just for those reasons alone, you should “Drive one, Buy one, Today ©”.